To produce 3D shapes, the tool converts vector outlines to polygons. This process can be very quick when using simple shapes that do not contain high levels of detail. 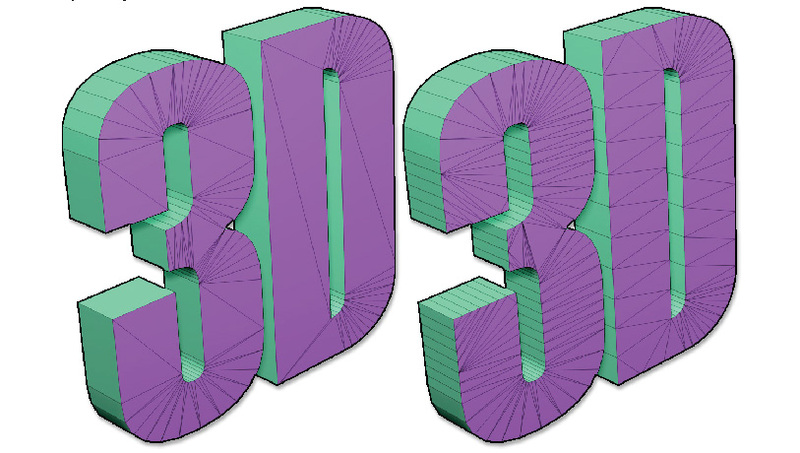 The more detailed that your font or shape is, the longer it can take to create a 3D model. The 3D engine built for this process has been optimized to produce high quality results with nearly any font or shape. However, this high quality can impact the speed of the process, especially when increasing the shape’s resolution. We strongly advise to begin by creating your text or shape with a low polygon count and then increase the Resolution setting only if needed. The vector 3D engine provides two modes to convert curves to polygons: Adaptive and Regular. These are toggled between by using the Adaptive switch. Both modes have their own pros and cons. When Adaptive is turned on, the engine creates the most even topology pos­sible across the model. This can be a benefit for future deformation but is slower to process. When Adaptive is turned off, the Regular mode is used. This creates long tri­angles but is faster to process. For complex shapes and fonts, it is advised to begin with Regular mode. Once you are satisfied with the styling modifications of your choice, you can turn Adaptive on to increase the quality of the end result. On the left, Adaptive mode. On the right, the Regular mode. Notice the differing polygon distribution between the two modes.